I like to think that some Americans, and other friendly foreigners, seeing LOCAL HERO and loving it as most everyone seems to, wonder “Who is THIS guy?” when they see Fulton McKay as the aged beachcomber, the stumbling block in the plans of Burt Lancaster’s oil consortium (represented by Peter Riegert) to buy up the coastline of a quaint Scottish island. Knowing a bit about writer-director Bill Forsyth’s methods, I see McKay’s old Ben as a particularly successful bit of writing. Forsyth loves character and dialogue and rather despises plot. Ben, by bringing the plot to an impasse which necessitates negotiation, forces talk to happen. And because Ben isn’t interested in negotiating, he keeps changing the subject. His digressions have dramatic value since they’re stopping the protagonist achieving his task, but through them Forsyth can enjoy what he’s really interested in, which is the talk itself. To British audiences, McKay was a familiar figure for one key role, though his career, in television particularly, was extensive. But it’s as McKay (pronounced Mick-EYE) in the TV show Porridge that he made his big impression. McKay was a tough, sardonic prison warden, the bete noir of the show’s convict heroes (Ronnie Barker and Richard Beckinsale — father of Kate). McKay the actor played McKay the character sympathetically, even though he’s a bit of a hard case and the show’s nominal antagonist (though other, more vicious criminals could also make things tough for the heroes). He did a lot of lopsided smiling and quite a bit of one eye goggling, one eye squinting, like James Finlayson but subtler. Everyone, after all, is subtler than James Finlayson. 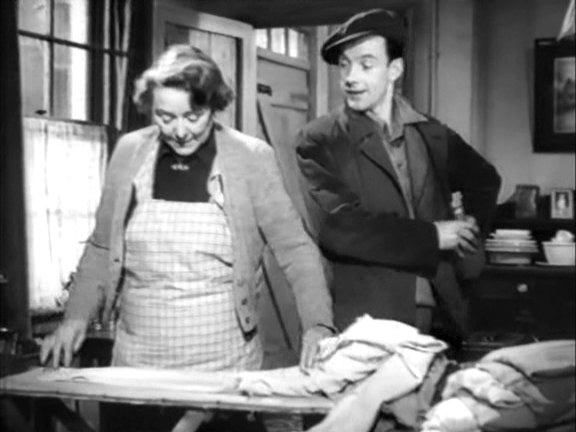 It’s in these roles of the seventies and eighties that FM made his mark on my memories, so I was intrigued to see him in THE BRAVE DON’T CRY, the last film produced by documentarist John Grierson, a Scottish-set film from 1951, directed by Philip Leacock (brother of documentarian Richard). A young McKay seemed inconceivable, since he’d seemed old when I was a kid. Would he even be recognizable, or would time have only kitted him out with all those attributes I knew so well further down the line? Fulton McKay is COMPLETELY recognizable, and what’s more the same qualities that served him so well in later life work quite nicely for the younger thesp. The way he crosses a room in wide shot, he’s immediately himself — something to do with the way his head bobbles ever so slightly, a cocky bobble — his head flares out like a cork and his neck is slender, so i guess a certain amount of jiggle is inevitable. His lips are very thin and his smile is oddly angular — uniquely, his mouth has more than the conventional two corners. And it only goes up on one side. Terrific actor. 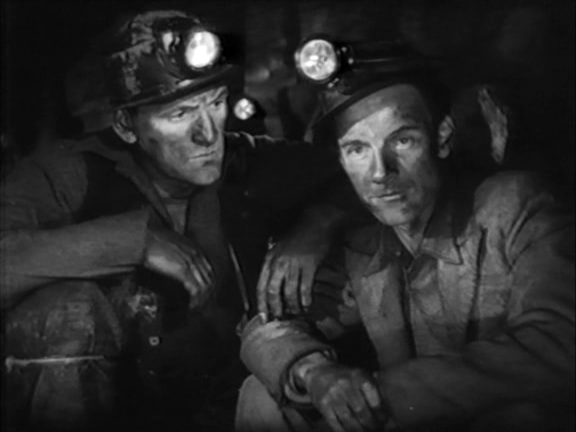 In the movie, he’s trapped down a mine with a group of other miners, his father killed in the subsidence. Lots of emoting to do. Then he breaks a leg. He’s not having a good day. The claustrophobic tension is strong, even on rather wobbly sets. 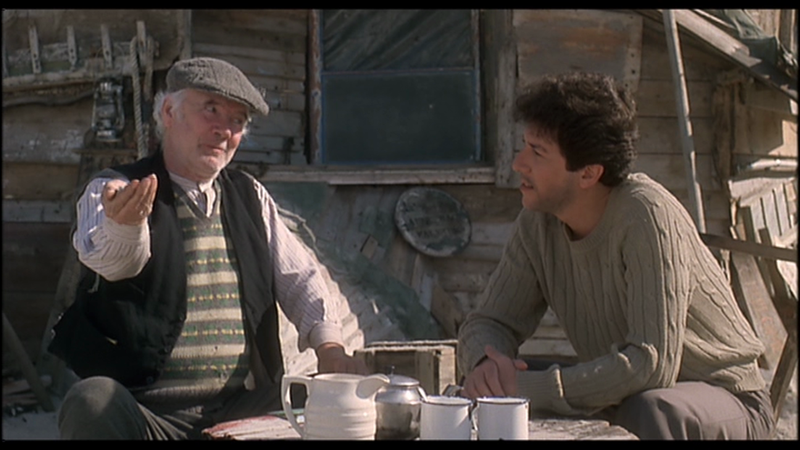 I wish he’d done more movies — he’s very funny in Stephen Frears’ first feature, GUMSHOE, with Albert Finney — but at least he was always busy. It may be his best work is buried amid all that ephemeral TV. Likely it happened on stage in some rep theatre on a rainy day, seen by twenty people. But what we do have is pretty wonderful. After enjoying SMILE so much, I resolved to watch more Michael Ritchie movies — he seemed kind of like a benign Altman. It took me a while, but I finally ran DOWNHILL RACER (1969), a movie I remember being on TV when I was a kid. I could never get into it then, and it’s obvious why when I look at it now. It’s mostly non-verbal; it doesn’t reinforce its visual moments with talk; the characters emerge very slowly; hardly anything is stated overtly; none of the characters is ingratiating. These aren’t narrative tactics calculated to appeal to a kid. Plus it was about sport, and I hate sport. But I now take the view that what a film is about, its surface subject, is irrelevant to its quality, so I watch war films and sports films if they seem interesting, despite my distaste for those particular forms of competitive activity. I also remember an interview where Bill Forsyth said that all stars have their self-imposed limitations, and the example he used was Robert Redford, who had never played an unsympathetic part. Well, I frequently find Redford unsympathetic but I realize I’m not meant to. But I would hold DOWNHILL RACER up as an example of RR playing a character mostly defined by negative qualities: he’s arrogant, anti-social, a dangerous driver, not a team player. He’s not a villain or even an anti-hero, he’s just a protagonist with few attractive qualities. 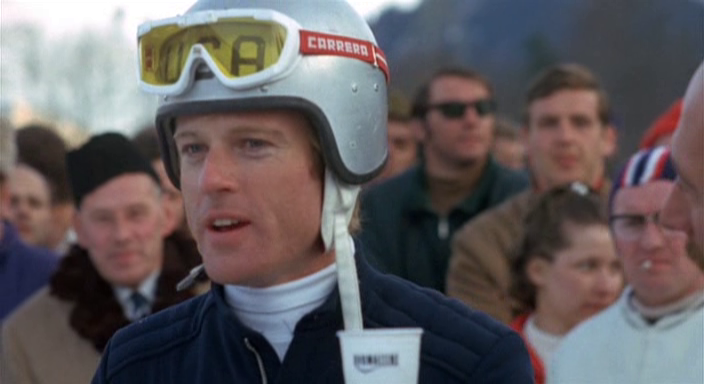 The movie succeeds in fairly minimalist ways — we are minimally bothered about whether Redford’s pompous skier will take home the gold, but we’re sort of intrigued about what sort of a journey he’ll go on as a person, since there’s no shortage of pressure on him to reform his ways. The lack of talk is really striking — much of what’s said is just chatter, especially that engaged in by sports commentators and journalists. The skiers exchange meaningless pleasantries. Redford fails to bond. It’s over an hour before anyone makes an actual speech. 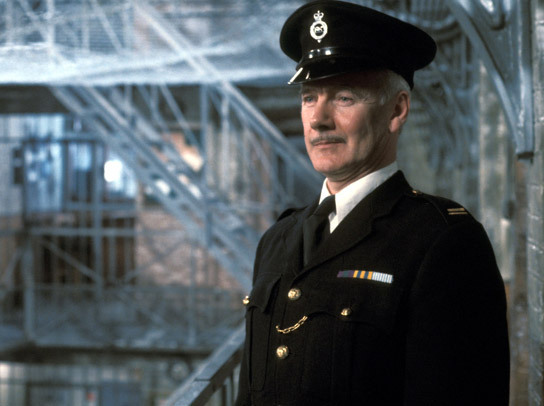 The honour falls to coach Gene Hackman. 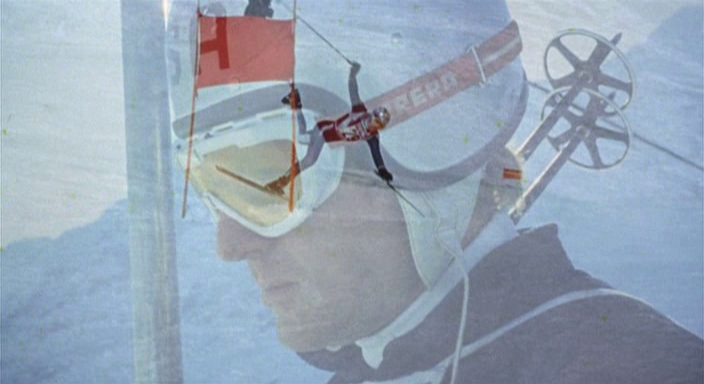 Via the DVD extras we learn that editor Richard A. Harris deliberately included some of Hackman’s slight line flubs, to emphasise the character’s emotion and to maintain the documentary realism achieved elsewhere by Ritchie in the ski footage. The skiing is great — it is actually one of the sports I find less offensive. It happens amid pleasant scenery and it doesn’t make a lot of horrible noise, though the commentators do. Almost every other sport occurs in a horrible environment or is very loud, often both. 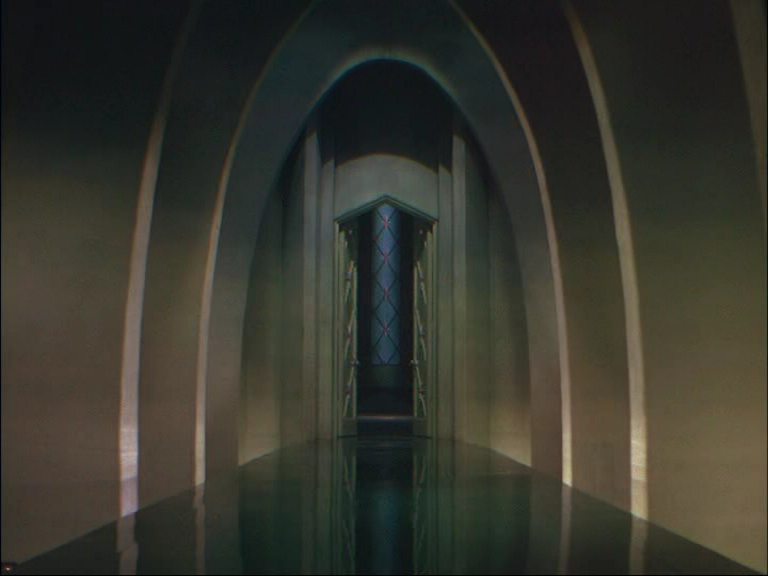 Here, they’ve dispensed with the shonky rear projection which plagued such sequences in older movies (and some later ones, shamefully) and they have the kind of spectacular crashes which you often see on TV sports coverage but which rarely figure in movies, because movies can’t afford to break too many legs. Here, Ritchie filmed the actual races, and whenever there was a particularly painful and flamboyant tumble, they would make sure they costumed one of their actors in matching duds so they could work the sprawling athlete into their narrative. Ritchie understands that each skiing sequence needs to be different (as each fight is subtly different in RAGING BULL) to avoid ennui. He holds back on the amazing POV shots (wide-angle lens footage taken by their lead skier, tips of his skis in shot, snow rushing past at such velocity that by the time an ordinary mortal like you or I have taken in an onrushing bump, or a snowman, or a tree, or a small child, we would have skied right through it. Harris cuts together really snazzy montages of preparation, too, giant closeups of tiny fastenings being adjusted, and the sound design has all these tinny tink, pting, klick sounds, which, spread apart with very soft wind underneath, create a kind of abstract, low-key suspense that’s somehow more deeply worrying than the bombastic kind (Harris also cut for James Cameron up to TITANIC). Really nice work — pure cinema, seventies style, before the seventies had actually started. I guess in that decade, things might have ended more darkly, but the WAY in which Redford achieves his inevitable victory is really neat, and pretty dark too.